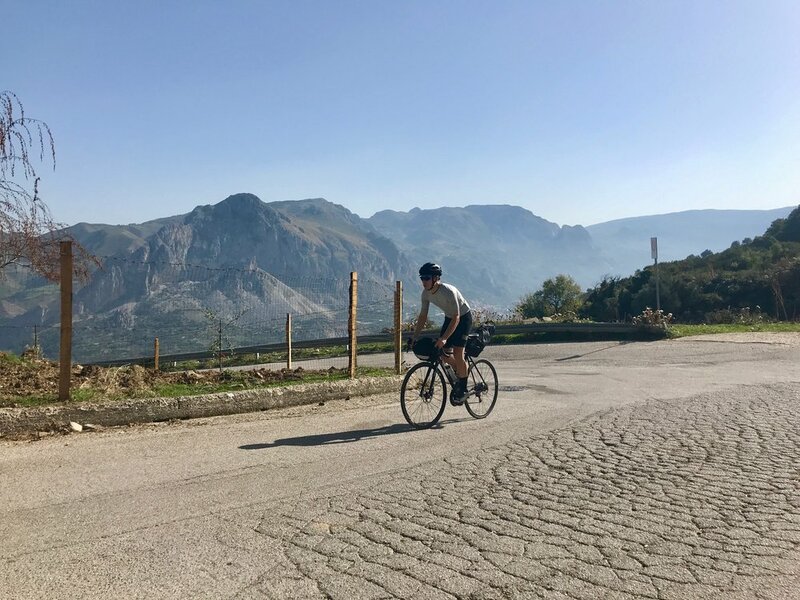 Shorts were being packed away for the season in the UK so Mono headed to Sicily, chasing the sun and hoping to ride some of the Italian island’s Giro D’Italia routes. 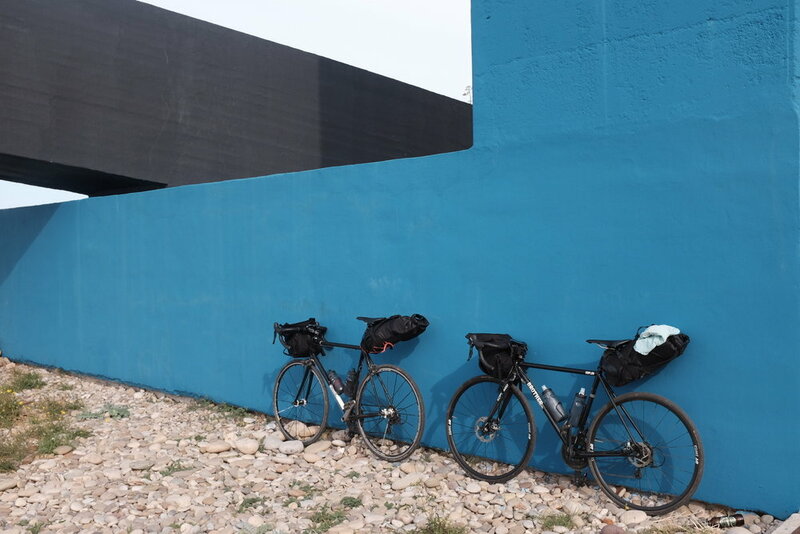 The plan was to explore as widely as possible in 7 days, carrying everything in two simple bike bags: a Roadrunner Jammer on the bars and Restrap’s 14l saddle pack on the back. There was a rough plan sketched pre-trip but the next day’s ride and a place to stay would be fixed over dinner each night, allowing for route changes if we had tired legs or discovered a fine restaurant along the way. Kit: Mono; Bike: Brother Cycles; Bags: Roadrunner Jammer and Restrap 14l saddle pack. After flying into Catania from London we dropped the bike bags at a central hotel that kindly offered to look after them for the week. From here, bikes were assembled and by 2pm we were on the road to Agira, a hill-top town with a long vista across the surrounding countryside. It’s a moderate climb to the peak, with the worst part being the roads into the town that ramped up all the way to our evening accommodation. On day 2 we snaked through mountains to Cefalù, a popular tourist destination on the opposite coast to Catania. The ride is spectacularly pretty, with arable pastures on all sides only interrupted by the epic bridges that spawn from the mountains and cut across the valleys. As expected in Sicily, it’s easy to find incredible food spots for lunch; we stopped in one of the many smaller villages, found a tiny restaurant and enjoyed an excellent Spaghetti alla Norma. After a morning swim in the sea we set off early afternoon to a farm and B&B, Giardino di Sicilia, that we found over dinner the previous night. It’s a flat, easy and fast ride along the coast, and the roads are smooth the whole way. The evening food was probably the highlight of the trip, with the hosts providing fresh bread, jams, olive loaf and olive oil from their land. With 2000m+ of climbing, this was one of the bigger mountain days, with the route taking in spots covered by the Giro D’Italia. Most of the climbing is around 5-7% elevation, but around 20km it hits some gnarly spots that top 25%+ at times; you’ll spend most of the time here just crunching the pedals and regretting the extra arancini ball you ate for breakfast. 25c in late October. Pure joy. Day 5 was our off day so we span down to Randazzo for a day at a villa and vineyard in the shadow of Mt.Etna. This is a 30km downhill stretch of smooth roads around the base of the volcano. From Randazzo, we took a whistle-stop tour of Taormina, a tourist favourite and shopping destination for the wealthy. From there the route winds up Mt.Etna and we joined our second Giro D’Italia stage of the trip. 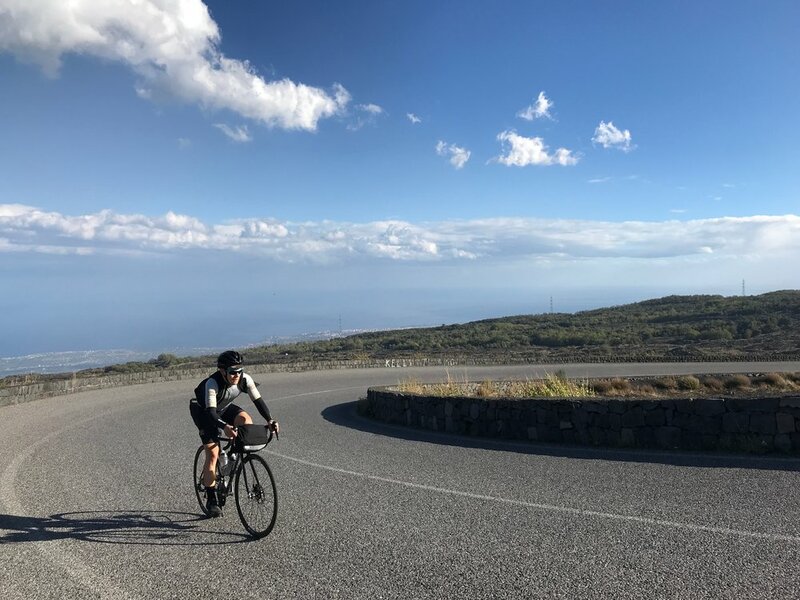 It’s a gentle grind to the top with elevation never getting any nastier than 12%, though given it’s the highest peak in Italy south of the Alps the weather is something to watch out for. As we hit the top a snow storm arrived, meaning the last 10km involved being blown from side to side of the road and shivering miserably. 25c to 0c in 24 hours. We both agreed this day was the coldest we’ve ever been on a bike. After the previous night’s flash snow storm we trudged down the first 4km of the descent on foot; not wanting to risk crashing with slick tires on snow. The route down is a classic mountain decline on a regular day, but we hated every second in the snow. Having been enjoying 25c heat all week, it felt crazy to be stopping to warm our hands every few km. We finally rolled into Catania early afternoon, packing up at the hotel we’d left the bike bags at on day 1.